It wasn't really the plan that I get so absorbed with designing patterns for fabric, but between discovering Spoonflower, my digital printing course with Frankie and Swiss and the portfolio course, I seem to have done just that. So, for those tempted to get some of your designs on textiles, I thought I'd share my experiences. Final Mongolian prints in Jade colourway on Kona cotton. These days, almost any design can be printed on fabric – photographs, detailed montages and illustrations, or plain linework. Just as in the paper printing world, where digital printing is increasingly the print method of choice, and the output getting better and better in terms of quality, so it will be with textile printing. The colour range isn't always excellent just yet, but depending on what fabric you choose to print on, the results can be wonderful. Digital printing also means anyone can produce a printed fabric. There's no minimum print run and the costs are really reasonable. So how do you go about doing this? I'll admit it's a bit easier if you know your way around Adobe Illustrator or Photoshop, but hand drawn art and a good scanner would also work. All the courses I've done have started by sketching things you might want to turn into a fabric design. 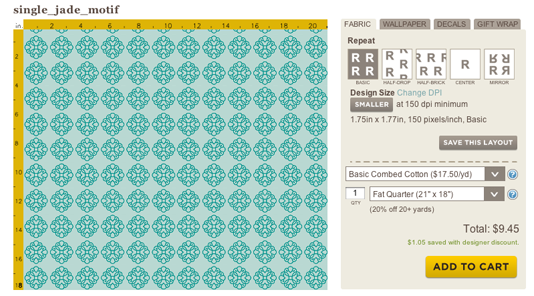 From the sketches, you simplify until you have a motif that you can turn into a repeat pattern. I uploaded this photo last post, but it's a good example of the process. Once you have a motif there are a number of ways of turning it into a repeat pattern. A good tutorial on Swiss repeats for those working by hand is here. For those working in Photoshop, it's the same as using the offset tool. Those working in Illustrator 6 are luckiest as the pattern tool lets you produce almost any kind of repeat with the click of a button! 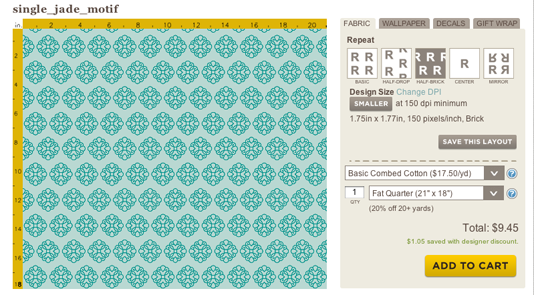 Or if you just have a simple motif, you can let Spoonflower do the work. This is the motif I used for one of my Mongolian-inspired textiles. 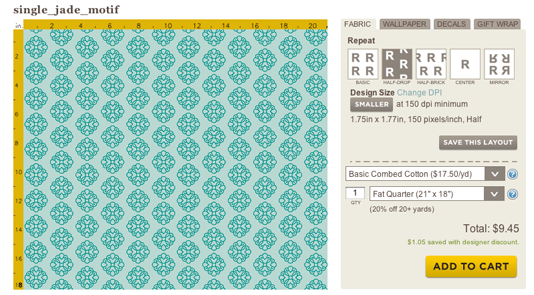 When you upload that into Spoonflower you can then choose the repeat style you want. Half drop repeat – this is the one I used for the finished design. You can then order a swatch of the fabric to make sure the colours are going to work. I ordered my swatches on the organic cotton sateen and they came up beautifully. It was when I went to order fat quarters on the Kona cotton that things went a bit wrong. I did order a colour map from Spoonflower which has 1400 colour chips on it for matching, but I'd ordered that on the Kona so I think that's where I should start with my swatches next time. 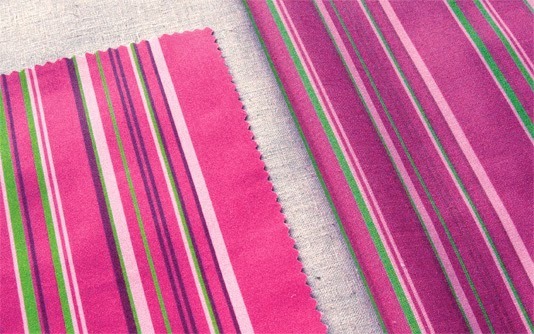 As you can see below, the stripes have good contrast on the sateen, but are barely visible on the Kona. It was only the burgundy colourway that seemed to have this problem – the jade colourway worked really well (as you can see from the pic at the beginning of this post) and so did the orange. Thankfully the burgundy colourway should be easy to fix as I can simply change the colours online. While Spoonflower gives me this kind of control, it's well priced and I'm generally really happy with the results – I'm also going to try sending a few more files to local company Frankie and Swiss. I can get a much more personalised service there and the turnaround time for finished product will certainly be faster (as they won't have to post from the US). At the moment Frankie and Swiss are trialling the print from my classes on a new bamboo fabric – so I'll give you more details on them – and show you the results – in a subsequent post. 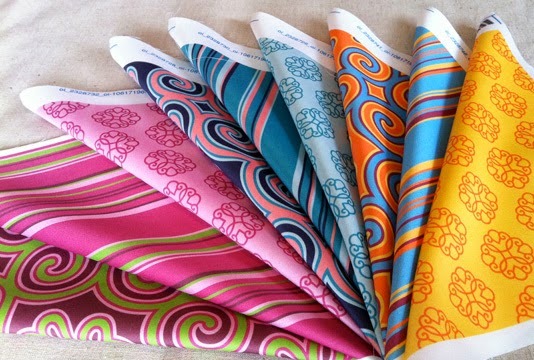 Have any of you tried Spoonflower or been tempted to design your own fabrics? I've been designing fabrics and having them printed with Spoonflower for 3 years now. Most of the time I'm really pleased with the product, but I have recently had a customer who purchased my design through Spoonflower complain of fading after washing. I'm hoping the the printing on the Kona fabric will prove to be more wash fast. One thing that I wasn't aware of immediately when starting to create designs is the importance of beginning (and ending) the process of creating your design in RGB colour mode. If you use CMYK it will throw the colours out and look very washed out. Hi Clair, yes I've been using RGB, but the colours certainly turned out better on the organic cotton sateen than the plain Kona. I'll be interested to see how the Kona Ultra goes. I like your WOFSYs – what a great idea! Hi, I'm curious what the Frankie and Swiss prices are like. Love spoonflower, but printing locally is always great. We got our fabric as part of the course cost, so I'm not really sure. I will be getting some test prints in the next month or so though, so I'll let you know.